President George Bush Jr. launched the costly Iraqi War on the basis of faulty intelligence reports that Iraq possessed Weapons of Mass Destruction (WMD). We all know that story. Soldiers searched and searched but they found nothing. Zilch, nada, nil, zero. President Bush has become a lame duck president due to the fall out from that and the popularity of the former Prime Minister of Britain, Tony Blair took a huge dip that he never ever recovered from. Actually, the WMD was there all along. Except it wasn't in Iraq. It was and is inside. Inside USA, inside the big countries, inside the big banks, the big financial institutions. Well, maybe ex financial institutions because they have fallen like dominos or have become nationalised. The insidious nature of the credit derivatives and swaps was remarked upon by Warren Buffet way back in 2003, around the time the WMD story about Iraq was started. The same guy that did not invest in Internet when the bubble was building in 1999-2000 and was laughed at and said to be out of touch. 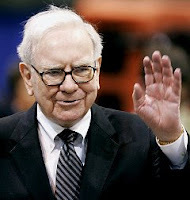 Warren Buffett closed down the subsidiary which dealt with these types of financial derivatives that is pulling down economies all over and said that it will take years to finish and close the deals. This article from the Economist explains the impact of the derviatives well. This article from MoneyandMarkets explains what a derviative is about, which is basically like a casino bet. If only George Bush had listened to the sage of Omaha instead of the CIA intelligence reports. What is Warren Buffett doing now? He just bought $5 billion worth of Goldman Sachs. I've gotta get me one of those. That is a clear as day buy signal.